Going into this review, we had some expectations in mind, having already reviewed an almost identical model, and if it wasn’t for the difference in the fans blade arrangements, we most likely would’ve bundled this in with the other review, however, we went ahead and tested it entirely separately. The main difference between the two is the addition of RGB lighting on the fan, which incurs a £10 increase in price. This also includes the in-line controller and a slightly different, and much easier, fan mounting system. In our opinion, the £10 increase represents good value if you wish to keep temperatures and noise down while also introducing a touch of RGB to your chassis. During idle and load tests, temperatures were in line with where we’d expect this to land, based on the results we found with the non-RGB model back in November, but we were surprised to find it so close to its brother in all of the tests, with the completely different 120mm fan. 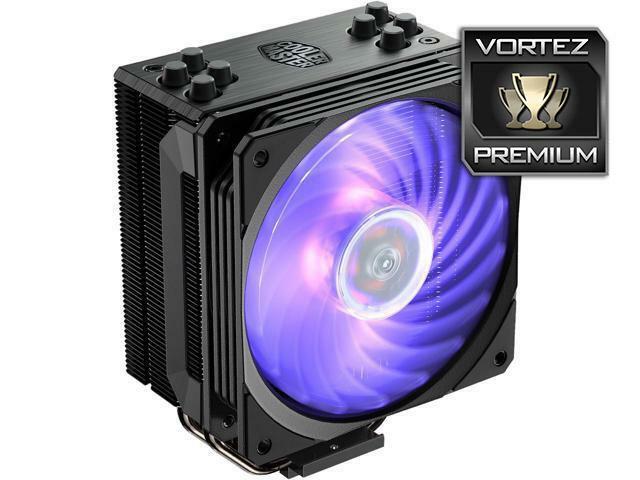 Overall, the Cooler Master Hyper 212 RGB Black Edition lives up to the reputation left behind by previous models, providing a cost-effective, quiet, efficient cooling solution, that also looks fantastic. If you want to add a splash of RGB to your case and have £40 to spend, we can’t imagine a better cooler to buy. The Hyper 212 maintains its excellent reputation.